It's about 3 1/2" in diameter. The shape was intended to loosely resemble an Iron Age Broch, though the taper ended up very shallow (otherwise the tray on the roof would have been impractically small). 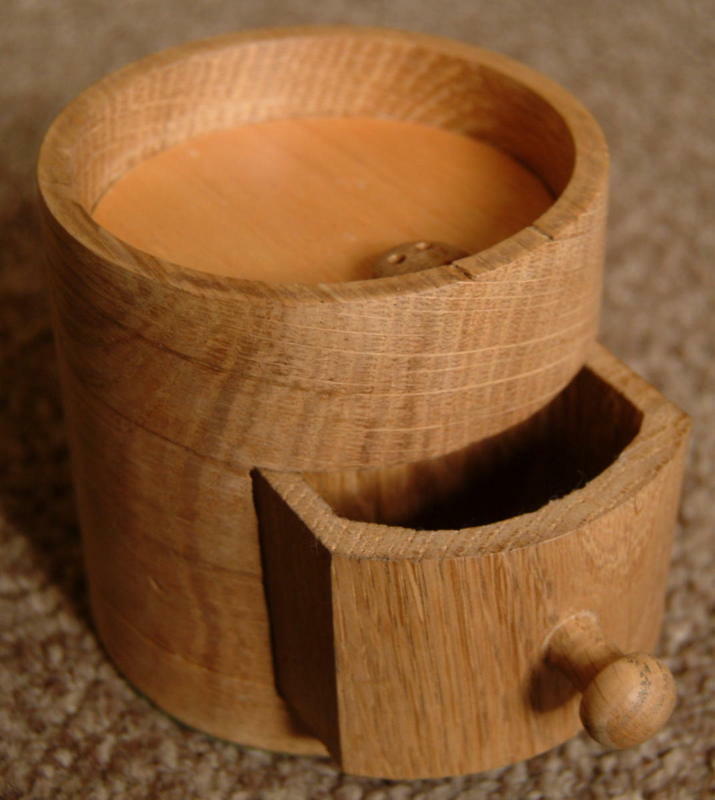 The drawer is made from a solid block of oak with the inside hollowed out. I roughly shaped the front, then temporarily screwed it into the cylinder and turned it in the lathe to make the shape of the two parts match properly. The floor of the tray, although it looks in the photo like plywood, is actually a piece of solid hardwood I had lying around (probably mahogany). There's a hidden magnet in the back of the drawer that holds it closed. The finish is beeswax. Disappointingly it looks rather plain (the front of the drawer is nicer than the walls), unlike the bowl I made for my Dad from a similar random oak offcut. I had a lot of trouble with the wood that I made the main cylinder from. It was a random offcut of air-dried oak that seemed OK (albeit very tough) when I cut the blank to size and turned the outside of it, but when I hollowed out the inside it somehow relieved the stresses in the wood which caused the walls to develop thousands of tiny cracks. The fact that I turned it cross-grain (mainly because of the proportions of the offcut and the shape I wanted the box to end up) almost certainly made matters worse. At that point I probably should have started again with a different piece of wood, but I was pressed for time and that was the only suitably sized bit of oak I had to hand, so I glued together the worst splits at the top edge and persevered with it. Frustratingly, more splits opened up when I morticed out the drawer hole, but I managed to glue them all back together fairly invisibly. That's interesting about the wax; I wonder if that's why the little oak bowl turned out so dark. I quite like it when oak goes a darker shade (without deliberately staining it) - I think it makes it look more 'aged'. I wonder why they thought it necessary to go to the trouble of kiln drying and laminating the replacement beams rather than just using green wood as would have been used originally. Perhaps they were concerned about the effect on the rest of the structure if the new beams moved as they dried.